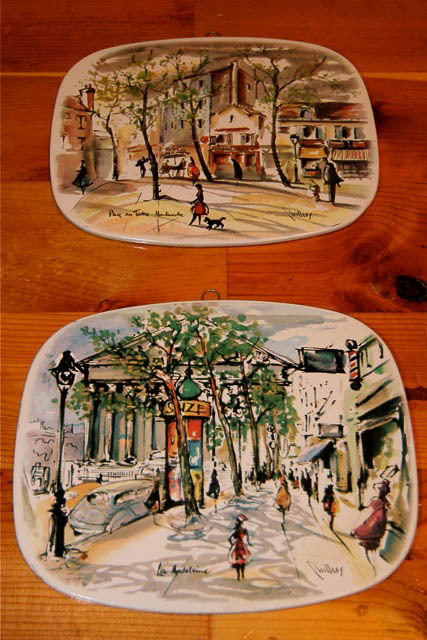 Home » By the Decade » 1960s & 70s » Avocado kitchen sink and appliances? Heck to the yeah, say Jon & Trixi! Avocado kitchen sink and appliances? Heck to the yeah, say Jon & Trixi! Jon & Trixi are back, with an update on the continuing un-remodel of their 1962 kitchen. They have slowly been (1) peeling away circa-2005 disprovements and (2) replacing millenial flip-this-house crappola with vintage goodness, all in the service of (3) reveling in their kitchen’s innate avocadoness. Look what went in this weekend! 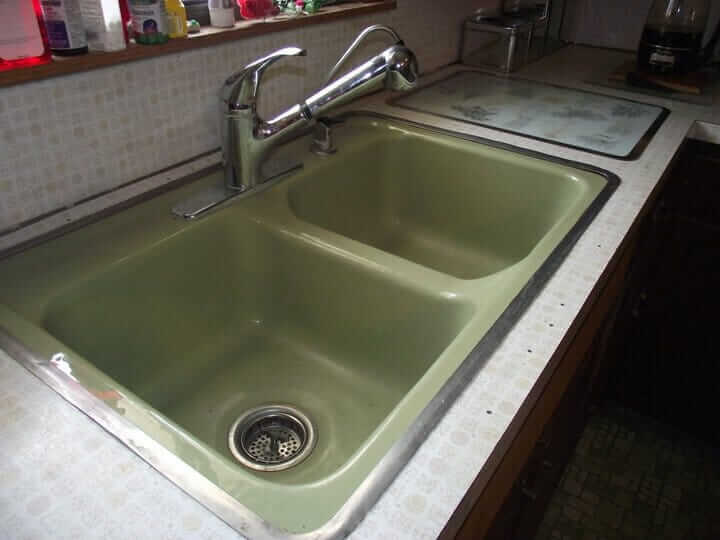 The avocado sink!! FIFTEEN HOURS it took, but it works and doesn’t leak! 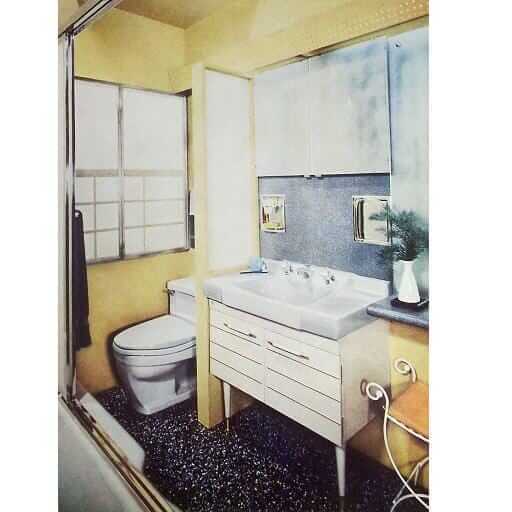 (OH — one last thing — if any of your Minneapolis readers are wanting a pink bathroom after the Pink Bathroom article in the Star Tribune a few weeks ago, point ‘em here: City Salvage. … We got our sink for super-cheap — the guy is dying to get rid of that stuff. We haven’t bought it yet — waiting for this next pay period, but our plan is to head there on Saturday. The guy told me there wasn’t a lot of call for avocado sinks, so there wasn’t much risk of it selling before then. It had a hudee ring!! A little bent up on one corner but I have high hopes I can gently hammer it back. But we have a working vintage Frigidaire fridge — in Avocado!! Goal: all matching avocado appliances. At long last!! It looks smashing! And one of the two “mystery holes” has been filled! All that’s left in countertop land is to install our avocado sink and get a NuTone Food Center happening. And then we’re FINALLY on to the cabinets. I think we’re gonna see the hugest change once we start working on those! My goodness, Jon & Trixi, you surely hath become king and queen of the hudees. We look forward, your royal hudee highnesses, to seeing the next installment of your kitchen adventures. 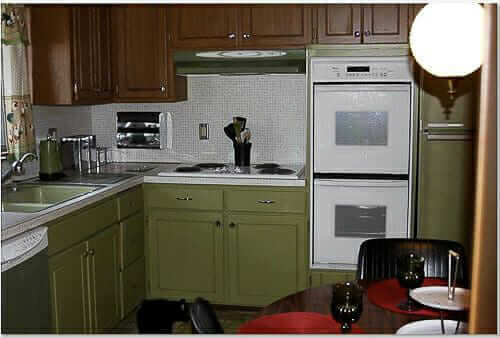 We are closing on a home next week that has vintage avocado appliances in it. All appliances have Never been used. They were bought in hopes of selling that home 30 years ago, but the sellers never pursued selling it until now. Are these things even worth any money or should I just sell it for scrap metal? Where do you live? If it’s anywhere near Oklahoma City I will buy them from you. Whatever you do, please don’t scrap them. Some of us are madly in love with avocado appliances and all things avocado/ 70’s. Great job installing the sink and the cutting board/hot plate. Other readers might like to know that one way to replace part of a damaged laminate counter is to install one of these and trim them out with chrome. The whole place is just shaping up to be gorgeous. Awww…Jon & Trixi, everything looks great! 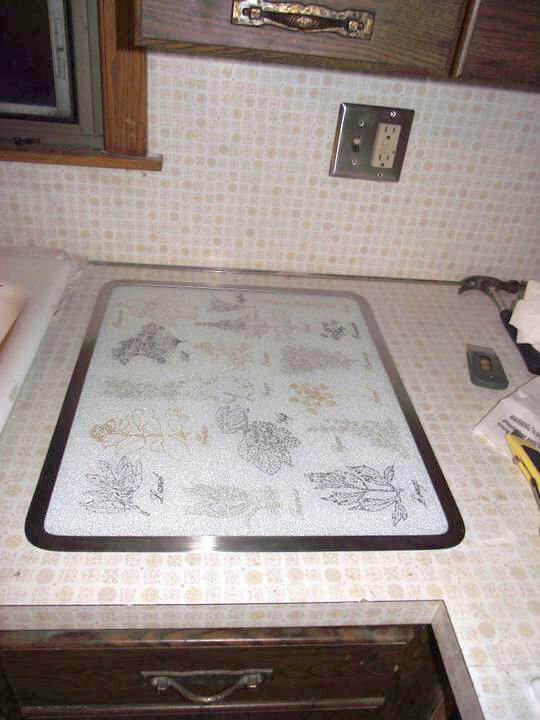 I grew up with those countertops. Sorry you have to let them go. Very authentic 60s(?) I think. I know we had them from my early childhood, at least (born in 1963). So homey. They were about to save the countertops! Wow! Looks great! Im in the process of refinishing an old 1969 travel trailer and i have an avocado sink just like yours. However my counters are not in the best of shape and need to be replaced. Id like to remove the sink and reinstall it in the best way and was curious if you could provide and tips for when i go to do this! THANKS in advance! Also an idea: Take photos of your un-install at each step … so that you have a record of how everything was assembled when you put it back together again. Good luck and hey, send us pics of your travel trailer when you’re *finished* and ready for prime time!